The Hook: The idea came to Jim Morrison during a sunrise spent at the crest of Laurel Canyon following a deeply depressed evening. Stats: Peaked at number-12 on the Billboard Hot 100. 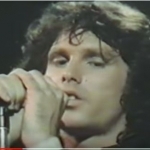 Background: “People Are Strange” was the first single off The Doors’ second album,Strange Days, and the follow-up to their breakthrough hit, “Light My Fire.” Guitarist Robby Krieger explains how the song originated. Doors guitarist Robby Krieger on “People Are Strange.